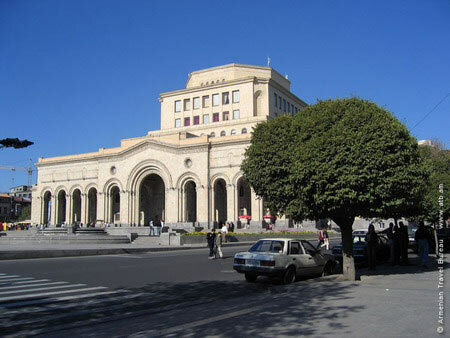 The National Art Gallery of Armenia is located inside the building of museum complex at the Republic Square, where the History Museum of Armenia is also placed. It was founded in 1921, as well as the history museum. The history museum occupies the first two floors of the building and the gallery occupies the floors from third to eight. It is the main art museum, not only in Yerevan, but all over Armenia. The Art Gallery of Armenia is also one of the largest museums in the post-Soviet space. It keeps the largest collection of Armenian art in the world. Totally, the museum has more than 20,000 paintings, out of which 350 paintings are the paintings of famous Western artists. The State Art Gallery of Armenia stores works of many famous artists such as Chagall, Rubens, Kandinsky, Courbet, Repin, Bryullov, Petrov-Vodkin, etc. also the gallery has the most complete collection of paintings by Aivazovsky. In addition, The gallery also displays paintings of Western Armenian artists such as Garza, Fetvadzhyan, Orakyan and others. The Art Gallery of Armenia is the best collection of fine art paintings in the Caucasus. It reflects the identity of the Armenian people, their features and traditions. Visiting Yerevan, you should remember that you would not have other opportunity to meet with the Armenian art so close. So, do not miss your chance to enrich your knowledge about the painting in the Caucasus.